In order to wrap up this Frisbee Dog 101 series, it's important to mention disc selection. There are many out there. First off, the discs you can buy at most pet stores are completely useless and, in fact, can harm your dog. They can be extremely brittle and have sharp rims which might cut your dog’s gums. At these sites you'll find a wide variety of discs for differnt situations. It’s best if you just buy a few (or ask me if you see me at a field and I'll let you throw any of mine !!) and start experimenting to see what works best for you and your dog. Some discs are softer, some discs are more bite resistant, some discs are smaller for small dogs; the options go on and on. Feel free to contact me at my email address, Bandit@Team-Bandit.com, should you have any questions or want to speak more on this topic. I'll be happy to help! Well, I hope this has provided you with a foundation for getting started with your dog and I REALLY hope to see you on the field one day. For now ... this is Chris, Bandit and "Flight Time" Kota signing off. 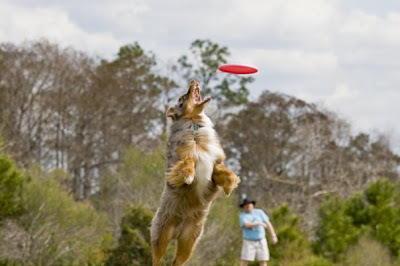 Part III: Getting Your Dog Ready to Become a "Disc Dog"
Check out my guest post at Dog Park USA!